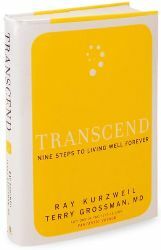 In 2004, Ray Kurzweil and Terry Grossman, M.D., published Fantastic Voyage: Live Long Enough to Live Forever. Their groundbreaking book marshaled thousands of scientific studies to make the case that new developments in medicine and technology will allow us to radically extend our life expectancies and slow down the aging process. Soon, our notion of what it means to be a 55-year-old will be as outdated as an eight-track tape player.